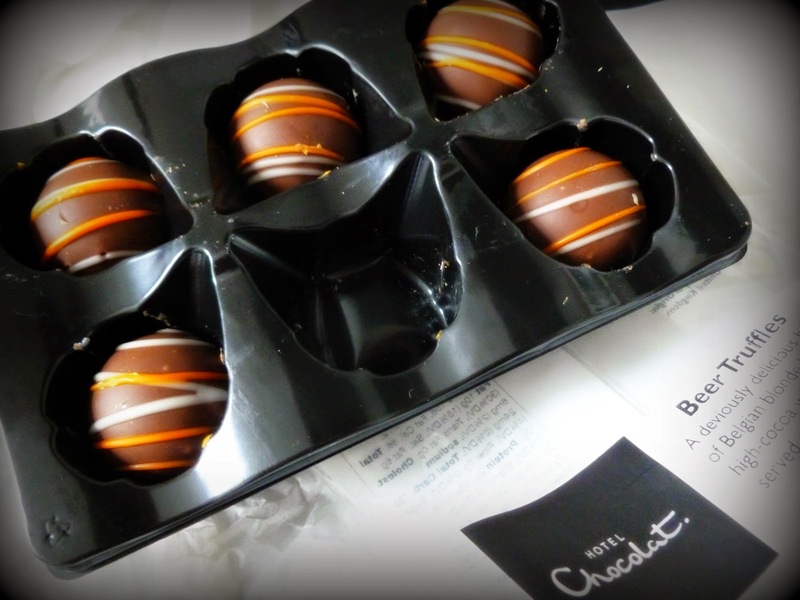 A Quirky Kook: Father's Day, The Hotel Chocolat Way. With Father's Day looming next weekend, cue the yearly clamour to find something, ANYTHING for the Man of the house that doesn't leave him weeping over yet another annual sock offering. So it was quite a relief to hear Hotel Chocolat have produced a whole range of Father's Day goodies for the occasion and an absolute pleasure to be sent some of the range to review. Hotel Chocolat have looked at their target market (men) and with extreme clarity of thought gone for a chocolate and beer theme to a selection of goodies. We were sent Beer Truffles and a bottle of Cocoa Beer to review. I know, chocolate made with beer and beer made with chocolate! Yum, and also hic! The Beer Selector truffles are made with Belgian blonde beer and high-cocoa white ganache all wrapped up in a milk chocolate coating. They're rich, creamy and gorgeous little balls of loveliness with the added tongue tingling taste of beer. The only problem would be restraining myself from eating them all before Father's Day, but as we had ours for review that was no problem at all. And of course you can't review Cocoa Beer without giving it a sip or, in fact, a very large glug either. 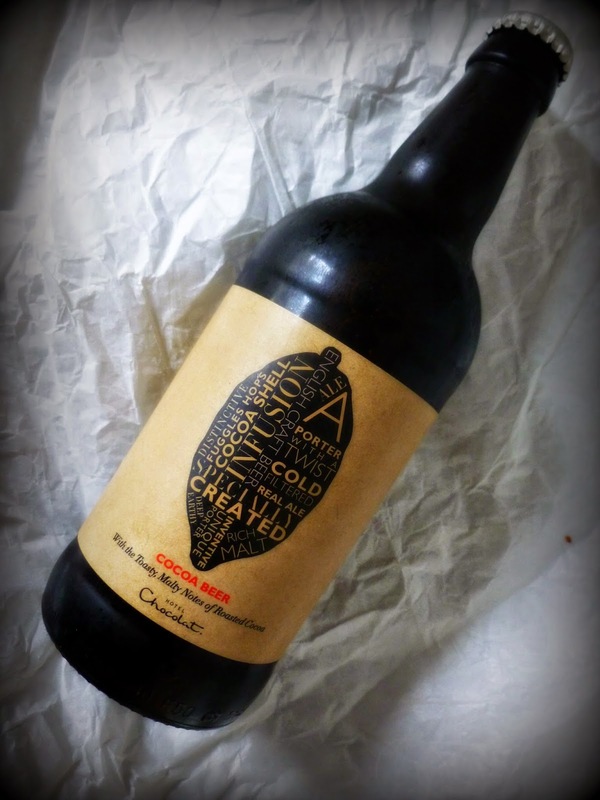 Hotel Chocolat's small batch English beer has been brewed In Bury St Edmunds using traditional Fuggles hops and infused with cocoa shells to give a rich malt taste to the beer. And the clever bit is the cocoa shells used in the process are left over from Hotel Chocolat's very own chocolate making so it's one for fans of recycling too. Little old wine drinker me, to paraphrase a famous quote, I don't know anything about beer but I know what I like and Hotel Chocolat's Cocoa Beer, I like. Toasty, malty, rich and frankly delicious. Hotel Chocolat have made a great selection of taste tantalising treats so you can give something a little bit quirky to your fathers, papas, daddies, dads, granddads or grandpas on their special day. Indulge them, they deserve it. Disclosure: We were (very happily) provided with Hotel Chocolat's Beer Truffles and Cocoa Beer for review. Opinions, words, photos, chocolate smeared mouths and beer hiccups are all our own work.